In third pAsuram – When asked “Would he give us this abundant experience of him?”, AzhwAr replies – Isn’t bhagavAn the most merciful in giving his perfect beauty and countless auspicious qualities for the enjoyment of countless exalted personalities? Hence, he would let us also enjoy him”. Subsequently, AzhwAr says “Such emperumAn who has distinguished forms, qualities etc is served by nithyasUris (eternally free souls of paramapadham)”. Third pAsuram. When asked “Would we only have the desire to serve him like this? Would he himself bestow us this abundance of joy in experiencing him?”, AzhwAr replies “When he is giving himself to those who are desireless [since nithyasUris’ desires are already fulfilled, they are not particularly desirous of anything specific], why would he not give himself to us who are desirous [to achieve him]?” . aNNal – aNNal means leader of kurinji (hill/mountains) region. It also means sarvaswAmi – lord of all. mAyan – Amazing person due to having beauty, simplicity etc. aNi koL sem thAmaraik kaNNan – His eyes are such that “For one who has such beautiful eyes, no need for any other makeup or decoration”. It is an ornament by itself, and can somehow (not perfectly) be explained by a lotus with broadness/full blossom, freshness, coolness and fragrance – having such beautiful eyes. AzhwAr is talking about the eyes that establish the initial contact [with those who are liked by him]. sem kani vAy – His smile will imprison even those who escape his glance. AzhwAr was also won over by his gentle smile only. karu mANikkam – AzhwAr is talking about his physical beauty that will deeply immerse those who are caught by his smile, in him. 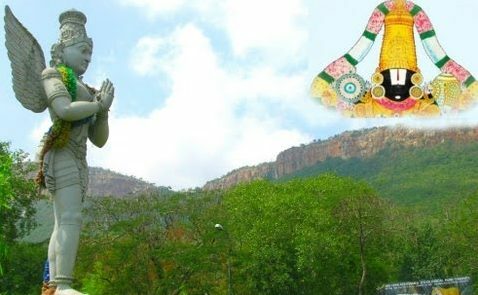 theL niRaich chunai nIrth thiruvEnkatam – In thirumalai which has ponds that have abundance of pristine water. For AzhwAr, not just emperumAn‘s form, even thirumalai itself is soothing. For him, “aNikoL sendhAmaraik kaNNan” (one with beautiful reddish lotus like eyes), “senganivAy” (beautiful reddish lips), “karumANikkam” (blackish blue gem like physical form) and “theNNiRaich chunainIr” (ponds with pristine, abundant water) are all the same. Because, all of these are seen in thirumalai. eNNil thol pugazh – One who is having countless and natural qualities as said in mathsya purANam 20 “yathA rathnAni jaladhE: asankyEyAni puthraka! …” (Oh child! like how the ocean contains countless gems and precious stones, bhagavAn has countless auspicious qualities). vAnavar IsanE – One who sustains the nithyasUris by giving his joyful experience of his auspicious qualities. AzhwAr explains that emperumAn would give his joyful experience to those nithyasUris who are always attached to him. This entry was posted in thiruvAimozhi, thiruvAimozhi 3rd centum on August 4, 2016 by Sarathy Thothathri.